This is the Lake's NATURAL colour!!! It’s not polluted. However, like any life form, lakes get older. 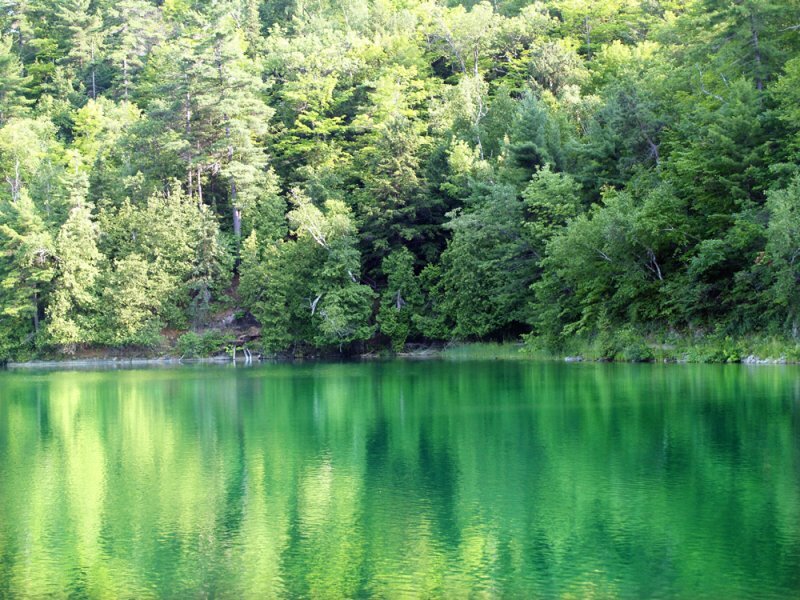 A lake dies when invaded with vegetation that usurps oxygen and suffocates it. Slowly, algae, tall weeds and trees replace the animal life. This natural process called “eutrophication” (plant growth caused by a strong concentration of nutrients) can stretch out to many thousands of years. When sped up by human activity, a lack of balance sets in, endangering the present wildlife. Unknowingly, we came by the hundreds to enjoy the site, to swim and picnic… without realizing that the erosion of the banks caused by these activities was putting natural fertilizer into the lake, which promoted rapid algae growth. The algae proliferated to the extent that eutrophication would have taken only a few decades if efforts to rehabilitate the lake had not been undertaken recently. Ironically, it’s that proliferation of microscopic algae that gives the magnificent greenish tint to the waters. Even though it’s spectacularly beautiful, it is very harmful.